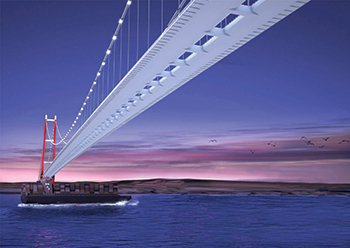 Berdan Civata is supplying steel anchor bolts and fastening products to the Canakkale 1915 bridge in Turkey. Canakkale 1915, located on the western end of the Marmara Sea, is expected to be the world’s longest suspension bridge once completed. Berdan Civata was awarded a contract by the consortium of Daelim and SK Engineering & Construction (SK E&C), along with Turkish companies Limak Holding and Yapi Merkezi, to manufacture steel anchor bolts and relevant fastening components for the project, says a spokesman for Berdan Cıvata. Berdan Cıvata is one of Turkey’s most experienced steel fastening manufacturing companies, hosting a fully-equipped and the only accredited test laboratory in its sector. It is manufacturing 762 sets of M85 x 10,178-mm 10.9 class of anchor bolts and its relevant components for the Çanakkale 1915 bridge project. The steel suspension bridge, with three lanes in both directions, is expected to be opened in 2023, the 100th anniversary of the Republic of Turkey. The 1915 Canakkale Bridge, located between Gallipoli and Lapseki, is part of the Malkara-Canakkale section of the Kinali-Tekirdag-Canakkale-Savastepe Motorway Project. The bridge will have a 2,023-m central span and total length of 4,608 m, while the Gallipoli approach viaduct will be 900 m long and the Lapseki approach viaduct will be 650 m long. It will surpass the Akashi-Kaikyo Bridge in Japan, the current record holder at 1,991 m span length. After completion, it will be the longest bridge in Turkey and surpass the Izmit Bay Crossing suspended bridge (Osmangazi Bridge), which has a central span 1,550 m and holds the title for the second longest bridge in Europe and the fourth longest in the world. For this project as well, Berdan Civata supplied 10.9 class of anchorbolts to its Japanese contractor, IHI Infastructure Systems. Founded in Tarsus, Turkey, in 1970 with a team of five people on a 150-sq-m area, Berdan Cıvata now operates on 33,000-sq-m premises in the Tarsus Mersin Organised Industrial Zone (OIZ) with 295 employees. Berdan Civata has been a reference manufacturer of many mega projects that include energy transmission lines, stadium projects, railways, petrochemical and steel structures. Some of the projects include the Cyprus Water Supply, where it supplied 6,500 hours of salt-spray tested special fasteners for water pipelines submerged 250 m in the Mediterranean Sea from Turkey to North Cyprus; the Trans-Anatolia natural gas pipeline projects; the Akkuyu Nuclear Power Plant; as well as wind energy projects of the world’s biggest wind turbine manufacturers. Berdan Civata has its own heat treatment and eco-friendly surface treatment facilities such as hot-dip galvanising, electro plating, zinc flakes, metalising and xylan coating. For its 10.9 grade bolts, the hydrogen embrittlement risk is eliminated by using eco-friendly coating facility, the methodology of which is patented.